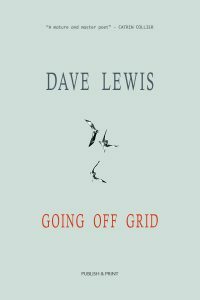 Pontypridd writer, Dave Lewis, has just released a new poetry collection – ‘Going Off Grid‘ – which is his seventeenth book and his seventh poetry collection. This modern collection focuses on digital capitalism, the negative influence of big tech and our addiction to data. Lewis is deeply concerned with the negative direction mankind is taking and cares passionately about helping to steer us all back to a far simpler, happier place in the far more important offline world. Death and depression, as well as love and nature, are also ever-present themes and the whole package is tightly woven together with some subtle, yet haunting, photographs. “An epic tour de force of modern poetry. The opening poem, (Diet), is reminiscent of T. S. Eliot’s ‘The Waste Land’ and this author’s ‘Roadkill’, but this time focuses on digital capitalism. Lewis is primarily concerned with the madness and addiction pervading our online worlds while we neglect the more important offline. The title is a hope rather than a statement. Published as a paperback and e-book in April 2018 by Publish & Print. To read sample poems click here.